First in the long line of greatly musical family, Marc began playing bass in high school at the age of thirteen, where he quickly began jamming with other classmates. This lead up to his involvement in a rock and blues cover band that would keep him busy for the next 4-5 years. 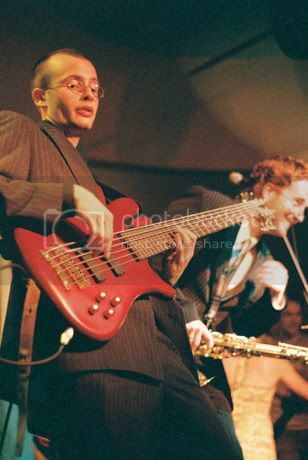 Marc's bass skills were further honed and developed whiled studying music at Vanier College in St-Laurent. The school did more than just spruce up his walk, it taught him to talk the talk. College afforded Marc a great deal of networking and led him to work with talents from around Montreal and outside the province including Kamikaze Mustang, Medad Ernest, Adam Karsh, 6feet10 and Jason Penolosa: these projects ranging from accompanying choirs, playing rock, jazz, gospel, blues, soul r&b and funk. Currently, when Marc is not swinging it up with The Jello Shots, he is recording and performing with a group called the Soulsektion.